Was Nathanael Greene at the Boston Tea Party? Daniel Granger was born in Andover, Massachusetts, on 2 March 1762. That made him thirteen and a half when he joined the Continental Army as a temporary substitute for his older brother, who had fallen ill and wanted to go home. It was the winter of 1775-76, and Daniel served nearly three months until his brother returned. I was not detailed to go on Sentury until about ten or eleven Oclock at Night, and it so happened that I was placed the lowest down on the [Lechmere] Point, by a larg Oak stump the most awfully cold, bleak place, no watch-box to stand in; and by orders, our Guns were loaded. Here I had to stand two hours, and tramp round the old stump to Keep me from freesing, and no other Sentinal in sight of me. And about eleven or twelve oclock the Sentinal that was placed above me, heard the Ice trickle down from the Rocks as the Tide fell off, which frightened him, I heard him hale, at the Top of his voice, “who comes there” twice I beleave, and then fired off his Gun and ran off, I could hear the Drum beating at the guardhouse to turn out the Guard, I cocked my Gun, looked and lissaned, but could see nor hear anything but the trickling of the Ice on the Shore, I was determined not to run, nor to fire, until I should see or hear some thing to fire at. and soon I saw two Men coming, and as they approached, I haled, who comes there, one answered “grand rounds” I then said grand rounds, advance & give me the countersign, they advanced, and when at a proper distance, I charged baonnet ordered them to stand, & give the Countersign. one answered, “Baltimore” which was the Word given to all the Senturies for that night I answered the word is right, and shouldered my Gun. They talked with me some time, asked me, if I heard the Sentury fire? I told them that I heard him hale, and fire, & his tramp on the Snow when he ran, but that I saw nothing, & was determined not to fire nor run until I did, they said, “I was a brave fellow” and asked my age, & on being told it, expressed astonishment, that I should be there so young. And early the next Morning an Officer came into the guard house & enquired for the Sentury that stood down the lowest on the Point in the Night at the time of the alarm, & soon found me, and took me into the Officers Room and I recollect the Captain’s name was Clough, he took me by the hand and sat me down on his Knees, praised me a good deal for my courage and said many pleasing things to me which made me rather Proud. 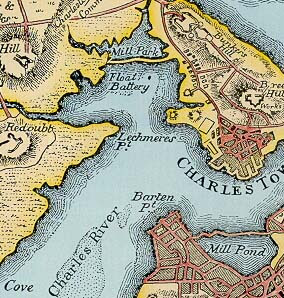 The countersign “Baltimore” lets us pinpoint this event as happening on 26 December 1775. My favorite detail is how Capt. Jeremiah Clough of New Hampshire sat the boy on his knee to praise him. That’s how young Pvt. Granger was. Daniel Granger evidently started to write down his recollections at the age of eighty and finished in 1848. A copy of the manuscript was transcribed and published in the Mississippi Valley Historical Review in 1930. Thank you for this! There was time when (way back in 2006...) that the Northpoint development in East Cambridge hashed a very aggressive marketing campaign to change the Lechmere Greenline trolley stop to Northpoint to suite their marketing needs. Now, thanks to you, I have solid reason as to why the name should remain. The Lechmere name has a very old history, commemorating the first big landowner in that area, Richard Lechmere. However, that means it also preserves the name of a Loyalist who left the country during the Revolution. Such are the ironies of history.